They're down - but not out. The Company thought it had taken care of the Losers. After they saw a little too much at the wrong place and time, their chopper went down in flames with no survivors and plenty of deniability - and the Losers went down in the records as just another team of black ops foot soldiers tragically lost to one of the CIA's shadow wars. But the Losers were just playing dead - and now that they've seen what the Company is really up to, they're through with games. Now it's time to take the fight back to its source. Download the first issue for free! "Never miss an issue. I'm down with The Losers in a big way. It's tough to make international espionage fresh, and I love that book." "A fantastic conspiracy theory thriller." "A terriffic caper created by British scribe Andy Diggle... With a muscular visual style - courtesy of resident artist Jock..."
"If there's a more consistently enthralling, action-packed comic than this, I'll eat my hat... Hollywood will be lucky if it can pull off a caper flick that’s half as entertaining as The Losers"
"Diggle's writing is sharp as steel, the plots are packed with action and intrigue, and Jock's craggy artwork, filled with noirish shadows, suits the story very well"
"This series is much more than just an action-packed extravaganza. There’s real depth to this series. Depth to the plot. Depth in the characters. It’s as intriguing as it is exciting, and as suspenseful as it is powerful... 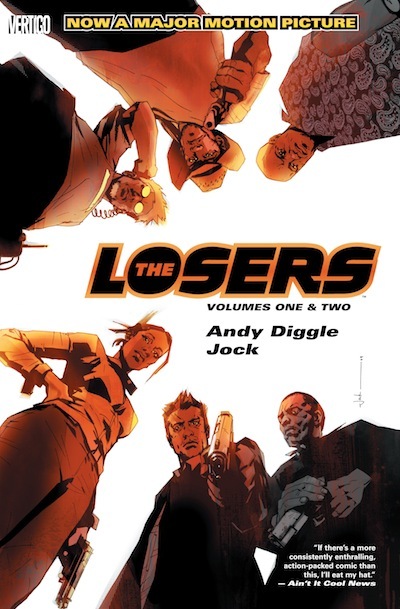 The Losers is the comic book equivalent of dynamite... Shockingly good stuff"